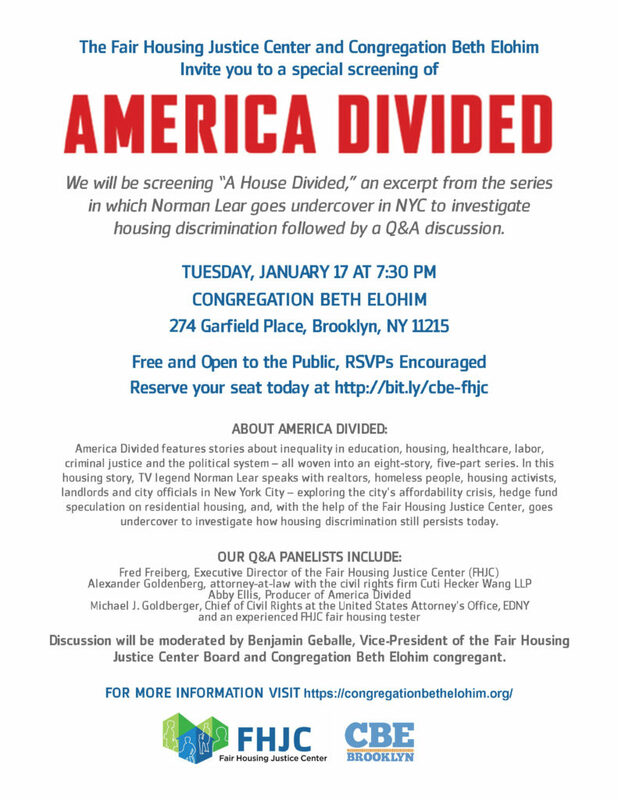 The Fair Housing Justice Center (FHJC) and Congregation Beth Elohim will host a free screening of the EPIX Original docu-series America Divided on Tuesday, January 17, 2017, at the Congregation Beth Elohim. America Divided features stories about inequality in education, housing, healthcare, labor, criminal justice and the political system – all woven into an eight-story, five-part series. This screening features one of these stories – “A House Divided” – in which TV legend Norman Lear, with the help of the FHJC, goes undercover in New York City to investigate housing discrimination. There will also be a Q&A session following the screening, featuring our esteemed panelists Fred Freiberg, Executive Director of the FHJC; Alexander Goldenberg, attorney-at-law with Cuti Hecker Wang, LLP; Abby Ellis, Producer of America Divided; Michael J. Goldberger, Chief of Civil Rights in the United States Attorney’s Office, EDNY; and an experienced FHJC fair housing tester. The discussion will be moderated by Benjamin Geballe, Vice President of the FHJC Board of Directors and member of Congregation Beth Elohim. The event promises to be night of thoughtful reflection and engaging conversation about housing discrimination. The screening will begin at 7:30 pm. The event is free and open to the public, but RSVPs are encouraged. To reserve your seat, visit http://bit.ly/cbe-fhjc. Reserve your seat now, as space is limited.